Developer Adam Dunkels, et. al. Contiki is an operating system for networked, memory-constrained systems with a focus on low-power wireless "Internet of Things" devices. Extant uses for Contiki include systems for street lighting, sound monitoring for smart cities, radiation monitoring, and alarms. Contiki was created by Adam Dunkels in 2002. He named his operating system after Thor Heyerdahl's Kon-Tiki raft. Development of Contiki has been continuous since that time. The Commodore 64 was fully supported as of version 2. 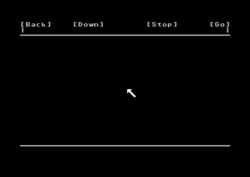 Version 2.5 floppy images are readily available for the C64, C128, and Apple IIe. Version 3 is current and MOS 6502/6510 hardware targets are still fully supported. Contiki provides multitasking and supports networking with a built-in Internet Protocol suite (TCP/IP stack), yet needs only about 10 KByte of RAM and 30 KByte ROM. A full system, including a graphical user interface, needs about 30 KBytes of RAM. Wired networking is fully supported in Contiki via RR-Net, TFE, and ETH64. Filesystem support is based on PFS, a leaner filesystem compared to the POSIX oriented one, which is able to handle path names according to the path syntax of CMD devices and IDEDOS. In addition primarily support is given to IDE64 . DHCP - a program for configuration TCP/IP and the network adresses. Email (disk 2) - client for writing and checking emails from a email webserver. FTP (File Transfer Protocol; disk 2) - for up- and download files to a file webserver. Some of the Contiki programs can used with a mouse, a joystick or a keyboard. Contiki DHCP for setting network adresses. Blank and easy Contiki Webbrowser. 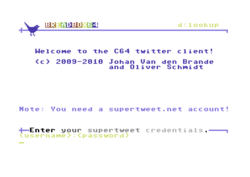 Contiki Breadbox64: A twitter client. Install Vice: contains the program c1541, that is needed for build-up the disk images. export AC=true - only for Apple II version. export C1541=c1541 - used for C64 version! export DIR2ATR=true - only for Atari XL version.